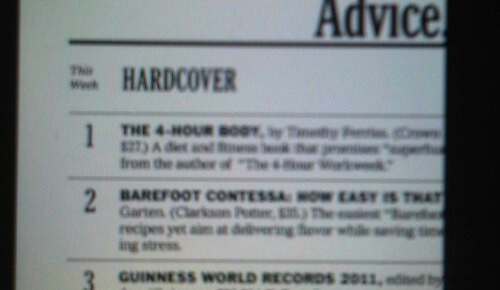 I’ve read (parts of) Tim Ferriss‘ „4 Hour Workweek“ and I’m really disappointed. That’s it? Get rid of time wasters, focus on what you want to achieve and outsource/delegate whatever you can. I’m a big fan of outsourcing and reducing stuff, but these nice visions of global mega-efficiency tend to forget one thing: The world consists of more than the US and the emerging markets like India, China or Brazil. If you need support for non-english-speaking tasks, (eg. researching social insurance regulations for freelancers in Austria) you will pretty fast feel as marginalized as if you were living in, say, Belize or Albania. I’m sure that Chinese or Indian outsourcing companies/personal assistants will learn German faster than local authorities will learn English, but that’s probably still not fast enough. And I’m still somewhat distanced to outsourcing or delegating everything, because I feel more comfortable if I really understand things, if I really know how they are. I don’t see another way of getting there but going long parts of the way on your own. Everything else feels like some kind of disposable throw-away-life to me: If you’re a Tango Dancer today, a Scuba-Diver tomorrow and a Kickboxer on the next day, you are most probably none of all these. To me, that provides as little experience as watching TV – and it turns you in the same dependent and helpless state. You always need others. – As a kind of counterposition to Tim Ferriss, I recommend Matthew Crawfords „The Case of Working with Your Hands – Why Office Work is Bad for Us“. It’s another voice that emphasizes the importance of doing instead of talking. And especially of doing what matters for you – not for others, for your jobs or for what you should be. That’s an Agent’s attitude. PS: I have not read the „4 hour body“ yet, but I’m somewhat surprised: „4 Hour workweek“ sounds promising, but to be honest: who spends four hours a week (or more) on physical workout? Black B. – Same river. Microblogging, Microfinancing – does everything have to be small and does it have to move fast? Because there is no time anymore for „real“ business?